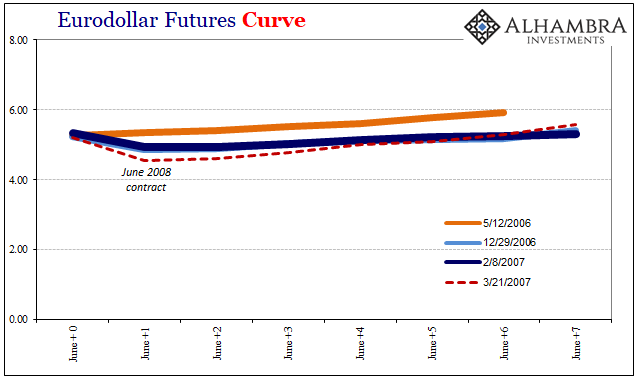 The eurodollar futures curve has already turned on them. That’s why the sudden interest in things like federal funds futures. If it seemed yesterday with the release of the last meeting minutes that the FOMC members appear to be getting nervous, there is good reason. The eurodollar curve is already slightly inverted. Remember, these contracts deal with probabilities and distributions especially when talking about bets on future conditions. What the very slight inversion signifies is that the market expects the Fed will raise rates as they have but get no further than around 3% (meaning 3-month LIBOR). The rest of the curve then prices more scenarios where even that is too far. In other words, the market just isn’t buying the economic story. Instead, it is buying that Fed officials buy it, but that over some unknown length of time reality will be imposed in a way that, on balance of probability, will force the FOMC to reverse course. This doesn’t mean these “rate hikes” are the cause, only that like the previous episode more than ten years ago they really don’t know what they are doing. As I wrote yesterday, this is beginning to look like 2007 stuff. Or, more appropriately, 2006. On March 20 and 21, 2007, the FOMC got together at their regular policy meeting. The major topics of that particular gathering are now entirely familiar, but at that point were just being introduced to the public beyond Wall Street. New Century had been in the news for the wrong reasons, a huge turnaround for the former darling, and then stocks had dropped suggesting rising nervousness about the whole subprime thing. Bernanke had told Congress subprime was contained just days before. That wasn’t just bluster, either. The meeting transcripts show that the FOMC wasn’t at all worried about what was going on, though they should have been. 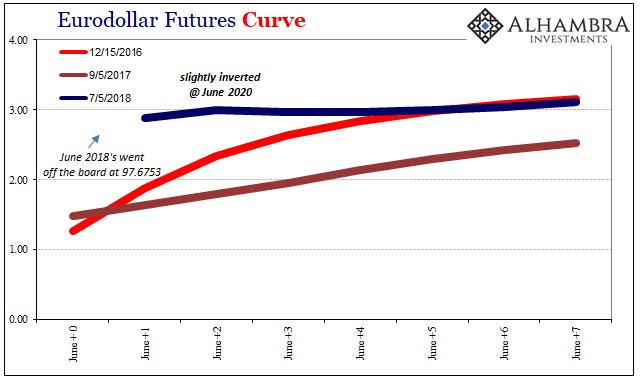 Months before New Century and HSBC, the eurodollar futures curve had, like now, inverted. What that said was this very important, deep market was pricing the same scenario as now only with much, much greater emphasis and immediacy. In essence, the FOMC which had stopped its “rate hikes” the prior June would be forced to reverse course in all likelihood toward the end of 2007 and into 2008. MR. DUDLEY. …they advised me not to take what was going on in the Eurodollar futures markets literally because they felt that some of them were putting on these positions in case of a bad scenario that led to significant reductions in short term interest rates. He and the rest of them (subprime is contained) just couldn’t believe how something like that would ever be possible. There were no bad scenarios in their forecasts or models, indicating there wasn’t anything little to be worked up about let alone something so big as was being priced in these money curves. I’ve highlighted the key word; unbiased. To the Fed, their projections were law. They still are now. If the Fed said money rates were going to be X and the market didn’t agree, that was, in the official view, because of bias not realistic interpretations of especially liquidity risk (these are money market futures, after all). As we know now, the markets were right to be concerned. In truth, they weren’t concerned enough as the curve didn’t really collapse until 2008. It speaks to the incredulity experienced by everyone to varying degrees; markets were a bit more realistic about everything, but still shaken by the disbelief that what eventually happened could really happen. The legend of the “maestro”, the Greenspan put, and all that. The events of that time were supposed to have been impossible, made so by the Federal Reserve and its presumed, but never tested, prowess. As it turned out, the Fed believed its own rhetoric and PR even long after the point (later 2006) when markets began to doubt them. Central bankers should have spent the early part of 2007 looking in the mirror, pushed into serious and honest introspection by such a serious market rebuke. This is the height of hubris. When they talk about “data dependent”, they merely mean what statistical probabilities ferbus and all the other useless DSGE models that don’t even incorporate the financial system spit out in their thousands upon thousands of Monte Carlo simulations. It’s not data; it’s never data. This is pure confirmation bias since the models are pre-programmed to believe everything that the FOMC does. To ignore the very important signals from very important markets is an intentional institutional blindness. It hasn’t changed over the decade since (oil prices are “transitory” and a strong dollar is a good thing). We are in many ways right back in the same situation. This doesn’t mean the system is facing another 2008. 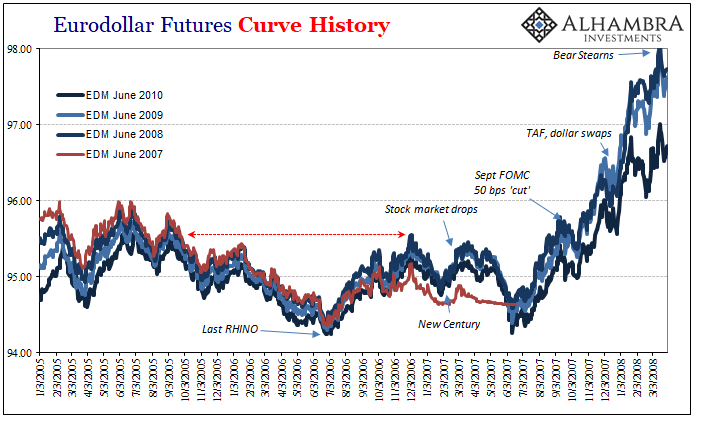 Rather, the futures curve is simply denying the Fed’s supremacy in forecasting and more importantly in providing effective liquidity (bank reserves). That’s why the curve is not just flat and slightly inverted, but more so where it is flat and slightly inverted – nowhere near normal. Officials believe right now the economy is “very strong” and that demands the same “rate hike” trajectory. The futures curve is betting there is a good chance they are wrong about that and at some unknown point they’ll have to turn around and face their own mistakes yet again. No wonder the FOMC has been studying federal funds futures. Will they listen this time? The market isn’t betting on it.